I’ve really enjoyed writing this one up as I have a complete obsession for these more unusual borders around the world. Sometimes there are even borders between places that others don’t class as a country. 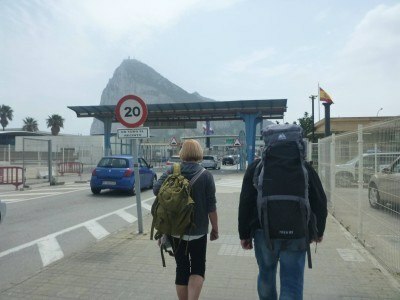 You might have read that I was recently backpacking in Gibraltar for the first time. It was my 46th country out of the 54 recognised countries in Europe going by UEFA. Gibraltar is a member of the EU but is not in the Schengen Zone. What I loved more is the fact that you learn that Spain has a land border with 5 other countries (Andorra, France, Portugal, Morocco and Gibraltar). Here I was ready for yet another adventure, I was upbeat as I made the trip from Malaga to La Linea de la Concepcion heading for Gibraltar. I started my journey in the city of Malaga which is in Spain’s Costa del Sol. Malaga is actually a decent enough spot for backpackers despite its reputation as a family holiday resort type place and indeed there are a variety of budget hotels in Malaga to base yourself in. To get to Gibraltar overland, you should try and base yourself in Malaga or Cadiz the night before as they are the bigger cities with more regular and obvious bus routes. 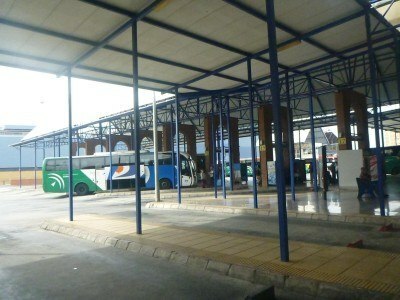 Provincial towns are also an option, but it will cost you more time and money due to the bus connections. 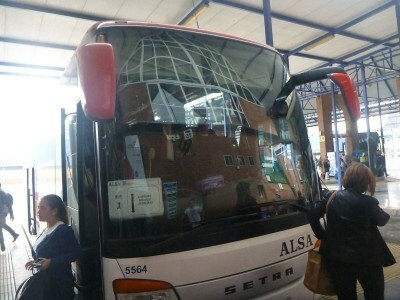 So I based myself in Malaga and got a direct bus from Malaga to La Linea de la Concepcion. I booked my bus online to ensure I had a ticket as I had no idea whether the buses got full or not. I used Avanzabus.com to book it. I went to the Avanzabus.com website and noticed they had a few departures per day direct from Malaga to the town of La Linea de la Concepcion. 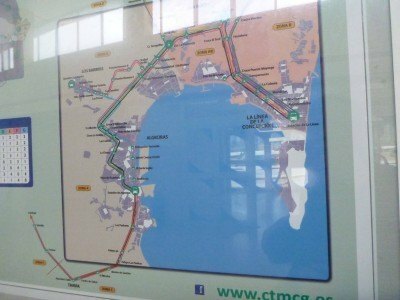 You cannot get a public bus straight to Gibraltar from Malaga, so get a bus to La Linea. 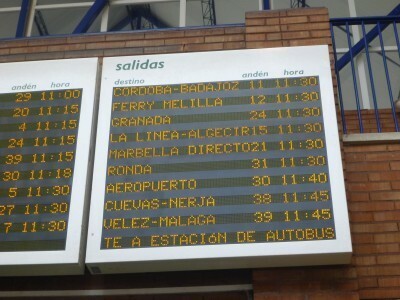 My bus cost 15.67 Euros and would leave Malaga at 11.30 am. If you book online, you need to print your ticket, I found an internet cafe to do this. If you turn up on the day, you’ll pay slightly more for your ticket and have the risk of the next bus being full, but you won’t have to print your ticket. From Malaga main bus station, I found out that the bus to La Linea (and onwards to Algeciras) was leaving from platform 15. This could change of course. I left Malaga bang on 11.30 am. The bus company is actually called ALSA despite the booking being from Avanza Bus. 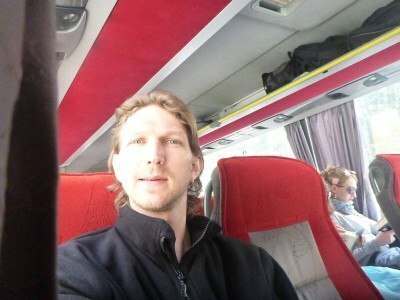 It was a dreamy bus ride along Spain’s famous Costa del Sol. I bought an ice cold beer for the journey, wrote up my travel notes and read Diego Maradona’s autobiography. I had the local Malaga beer – Victoria. A beer and Maradona’s autobiography! 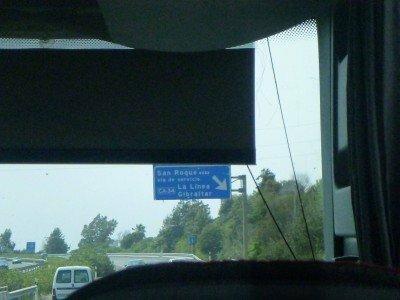 When I left Malaga, the bus was full of only Spaniards, but that all changes on the route down the coast as you stop off at all the resorts on the way. 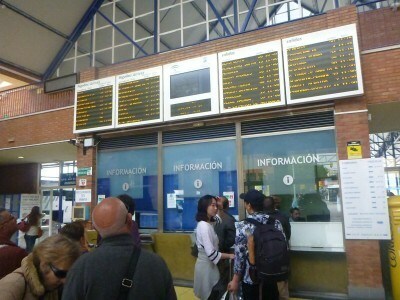 We must have had about 10 stops on route to La Linea de La Concepcion to drop passengers off and pick more up. On the bus from Malaga to La Linea de la Concepcion. So the journey was almost exactly three hours, would be less than 2 hours without all the stops I reckon. 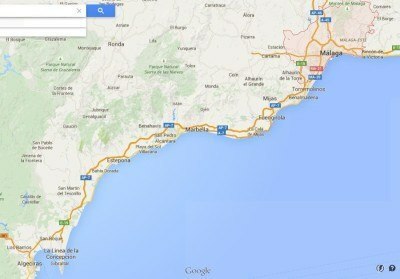 Here is a map so you can see the route, driving south west out of Malaga. 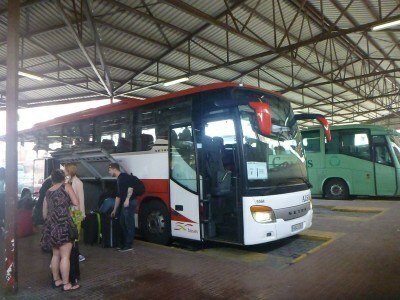 You arrive at the main bus terminal in the town of La Linea de La Concepcion. 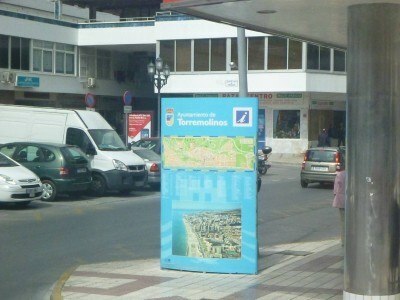 La Linea is not really a touristic town at all, it kind of serves its purpose as being the town that borders Gibraltar. 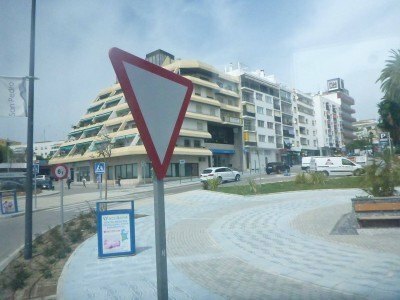 Once at the bus station, leave through the front exit and it will be obvious which way it is to Gibraltar. You won’t need a map or to ask anyone. 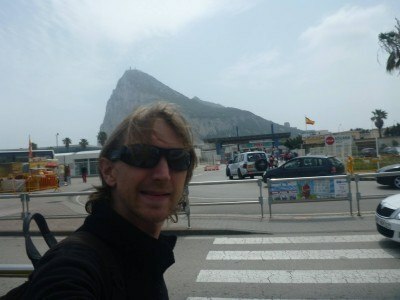 After leaving the bus station at La Linea de la Concepcion, it’s a quick walk towards the border point with Gibraltar. You can;t actually miss it, as it’s obvious which way is south. 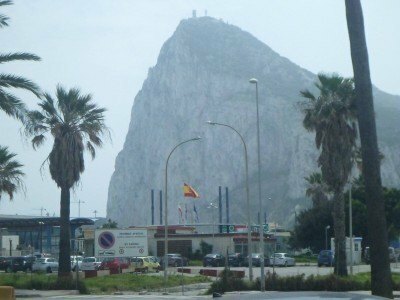 You will see the famous rock of Gibraltar and I would say if walking fast from the bus station, you will be at the border exit for Spain within 5 minutes. So basically just follow the rock! Follow the way to the Rock of Gibraltar! You’ll see the Spanish flags for the exit from Spain and the entrance to Gibraltar in behind. If you want to change your Euros into Gibraltar (British) pounds then you can do so before you leave La Linea. Personally I had lots of pounds on me anyway so didn’t need to. You can also use Euros in some bars and restaurants in Gibraltar, though the exchange rate is higher – pounds are better! I’m biased of course. When leaving the Spanish side there was no border control or check point. This may vary from time to time. It’s a simple walk to the border and into Gibraltar. 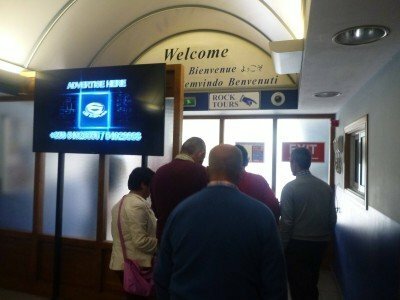 On the Gibraltar side there is an indoor office for passport checks. 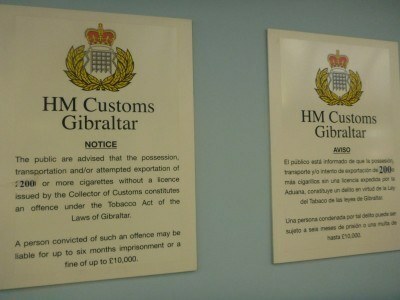 On the day I crossed into Gibraltar, all passports were checked and there is some immigration information up. There were a couple of other backpackers in front of me and there was a big queue to cross the border. 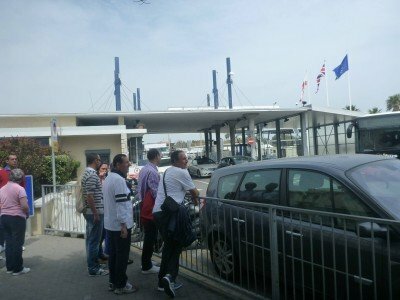 Despite the big queue, it only really took about 6 minutes to cross the border into Gibraltar. My passport was checked only, not stamped. There were no bag checks and no paperwork to fill in. It was all very simple. UK and EU passports don’t require a visa to visit Gibraltar, though it is not officially in the Schengen Zone, which is similar to Andorra (which is not in the EU) so you can get your passport stamped if you ask them apparently. I didn’t see anyone else doing this. You’ll see the Union Flag of the UK, the EU flag and the Gibraltar flag on the Gibraltar side of the border. 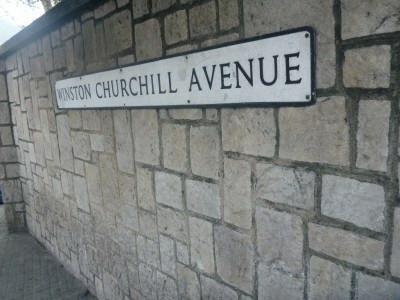 Once you have passed through the immigration hut, you are now on Winston Churchill Avenue and ready to explore Gibraltar. You can get a bus from the border to the town centre of Gibraltar. 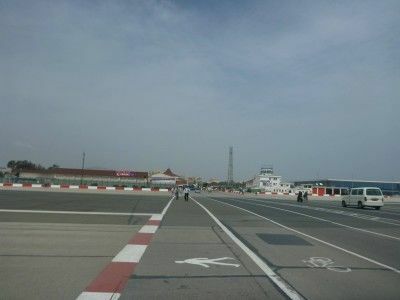 I chose to walk in the heat, which takes you past (across) the runway of Gibraltar International Airport! Walking from the border to the town centre is only about 20 minutes so it’s the best backpackers option! 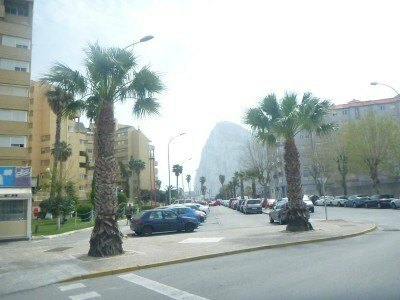 I loved my time in Gibraltar and I stayed in the cool downtown Cannon Hotel. 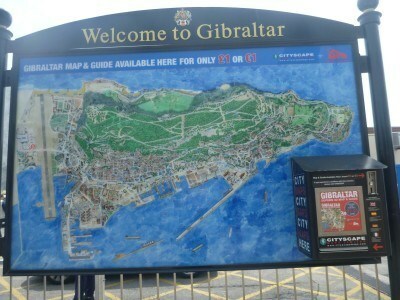 I toured the top of the Rock, Europa Point and the main sights of the town centre. Some people class Gibraltar as a silly and odd place. And while it does have its doubters, I’m not one of them. I liked it and on talking to the people in the country, there is no chance of it being swallowed up by Spain. It is a country on its own right, and a proud one at that. 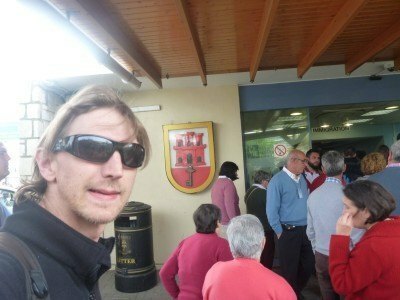 If you want to check out my post about coming the other way, I left Gibraltar by foot, for La Linea de la Concepcion. 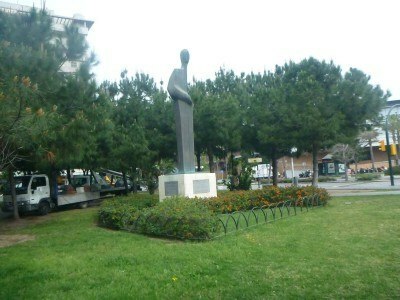 This entry was posted in Europe, Gibraltar, La Linea de la Concepcion, Malaga, Spain, World Borders. Bookmark the permalink. Just a minor correction, you say “UK and EU passports don’t require a visa to visit Gibraltar, though it is not officially in the EU similarly to Andorra”. Gibraltar IS officially part of the EU. The member state of the EU that is called ‘the United Kingdom’ actually comprises the both UK and Gibraltar. 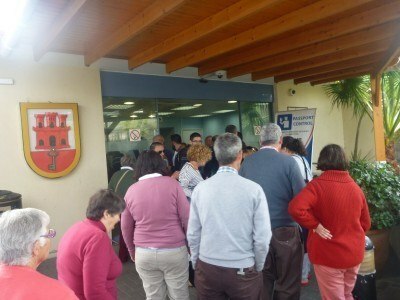 The people of Gibraltar vote in elections to the European Parliament, etc. Gibraltar is the only British overseas territory that is part of the EU, none of the others are. (Gibraltar is a democratically self governing British overseas territory, it is not part of the UK, and the UK is not part of Gibraltar, although they have an ‘integrated constitutional relationship’ with each other, whereby the UK handles external affairs and defence). This differs from Andorra which is not part of the EU. Gibraltar IS part of the EU, but – like the UK and Ireland – it is not part of the ‘Schengen Area’ – this is an area where immigration (passport) controls are removed. But the Schengen Area is a different thing to the EU, there are non-EU countries – such as Switzerland – that are part of the Schengen Area. 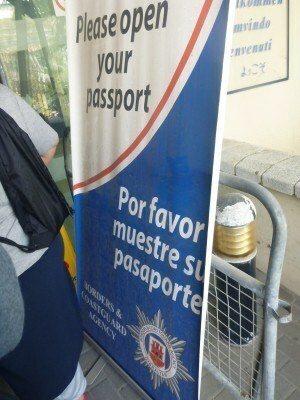 This is why there is passport control between Gibraltar and Spain, but not France and Spain, etc. Additionally, Gibraltar is NOT part of the European Common Customs and VAT Area – this is again slightly different to whether you are part of the EU, various bits of the EU are not part of the VAT area (e.g. Spanish Canary Islands, etc) and various non-EU places that ARE part of the European VAT area, e.g. Isle of Man, Monacco, etc. – There are both customs (goods) and immigration (identity) controls between Spain and Gibraltar, even though both are part of the EU. – EU citizens have a right of free movement, as such they can not be refused entry and do not require a visa. Additionally, as they remain within the EU, they can use their national identity cards (if their country issues them) for travel in place of the their passport. – Various other nationalities also qualify for visa-free entry. See the Gibraltar Borders and Coastguard Agency website. Just one point of order in what is otherwise a great blog…Gib is a full member of the EU by virtue of the 1972 Treaty of Rome as part of the UK, but is exempt from the Schengen Accords (As is the UK), and from the Customs Union. Glad you enjoyed Gibraltar , hope you will return. Great article AGAIN!!! I didn’t even know there WAS a country called “Andorra!! !” I have somewhere new to go now! Thanks for the great work! I found this blog now in July 2018. I’m doing the same trip and trying to book the bus trip for the end of September and can’t do it. I’m walking the Camino de Santiago and then going to Gibraltar. 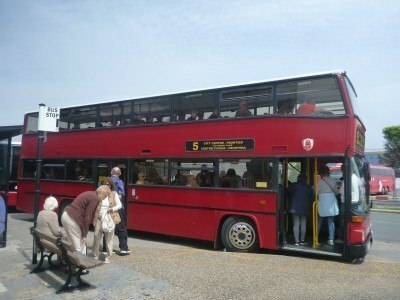 I would like to get my bus ticket to Gibraltar before I leave the U.S.